How Does Orthotropic Treatment Help Smiles Develop? As children grow, their smiles develop and change. For some, complications may arise during this process, leading to problems with sleep or tooth alignment. 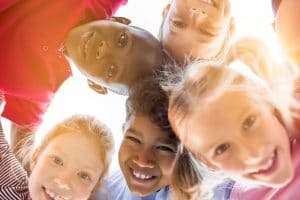 In order to help our young patients in Livonia, MI, enjoy optimal oral health, we may suggest orthotropic treatment for patients as young as age three. True or False: Sleep issues could be a sign treatment is necessary. True or False: Orthotropic treatment could prevent sleep apnea later in life. True or False: Treatment often involves an oral appliance. True or False: Treatment impacts the smile’s appearance as well. True. If you notice your child has trouble falling asleep, fights bedtime, wakes up in the night, or feels tired or restless during the day, then you should take our Child Sleep Health Questionnaire and bring them in for a diagnosis. Other symptoms include behavioral issues in school, as well as delays in emotional and behavioral development. Nightmares, sleep walking, and talking/screaming during sleep also indicate trouble. True. Orthotropic treatment guides the development of the jaw, as well as the oral tissues and structures. As a result, children have an easier time breathing as they sleep. Later in life, this means a reduced risk of obstructive sleep apnea, a serious sleep disorder that has negative impacts on quality of life. True. To guide the oral tissues and structures, we will employ a custom-made oral appliance. The appliance will be worn as the child sleeps, offering a comfortable and minimally invasive solution to breathing problems. True. Orthotropics also guide the eruption and alignment of your teeth, impacting your smile’s appearance. Treatment at an early enough age even reduces the chances that a child will need braces or other orthodontics later in life. Our team offers quality care for children of all ages. James Stewart, DDS, and our team serve patients from Livonia, MI, as well as Farmington Hills, Farmington, Plymouth, Northville, Novi, Dearborn Heights, Dearborn, Garden City, Westland, Redford, and the surrounding communities. To schedule a consultation, call our office today at (734) 425-4400.